Do you need an "I've been out of town all weekend and have nothing in my fridge but want to put a healthy meal on the table pronto and have lunch for the week" kind of dish? For me, that dish is my 100% plant-based and pantry-sourced dhal and rice. It also get cheers from every single eater in my family. We make different variations of dhal, changing up the lentils, spices, aromatics and even the oil, but this Bengali Red Lentil Dhal cooks up quickest and uses the fewest ingredients. If you have them handy, you can brighten it up with chopped fresh tomatoes, cilantro leaves and slices of serrano or jalapeno peppers, luckily all things available from the garden this time of year. But those additions are not even necessary. I have my Bengali-American friend, Ritu, to thank for this recipe. She taught it to me years ago before [tear] moving West. This dish comes closest to replicating the staple meal I ate daily while studying abroad in Nepal, half a lifetime ago. My quest for mastering dhal-bhat ended when Ritu showed me the ropes and her mom's recipe. While I'm at it, I guess I should also thank Ritu for providing fierce competition in office cooking challenges, forcing me to step up my game, and ultimately propelling me to culinary school. What is dhal exactly? 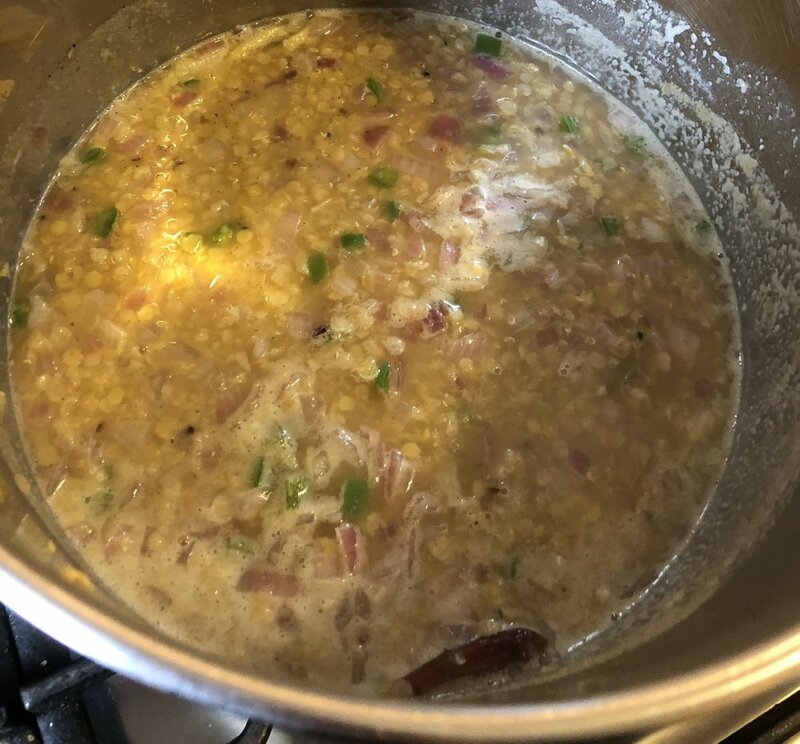 The word dhal comes from Sanskrit meaning "to split" and refers to a wide array of lentils, peas and beans (or pulses) that can be used to make dhal. But what distinguishes dhal from any other lentil soup or stewed pot of legumes is the tarka or tadka. This hot aromatic oil seasoned with onions, garlic, ginger, chilies, and toasted and ground spices is added to the cooked lentils toward the end of the cooking and adds dramatic flavor, color, digestive fire, and healing properties to the dish. Panch Proon translates to "five spice" and includes equal parts fennel seeds, cumin seeds, whole fenugreek, black mustard sees and nigella (onion or black carraway) seeds. My panch proon blend is featured here with coriander seeds also used in this dhal. Soak the lentils in a large pot of cool water for a minimum of 20 minutes (optional). Rinse thoroughly until water runs clear (not optional). Return the lentils to the pot and cover with 4-5 cups water. Bring the water to a rolling bowl, add the salt, reduce heat and simmer until lentils are tender. In a separate sauté pan, toast the spices until fragrant and lightly browned, about 30 seconds. Remove from heat. Allow to cool and then grind coarsely in a spice grinder or mortar and pestle. Make the tadka. In the same sauté pan, heat ghee or coconut oil over medium high heat. Add the onions and a pinch of salt. When onions are soft, add the garlic, ginger, chili and ground spices. Sauté about 1 minute longer. Pour tadka into dal. Add the diced tomato, if using. Simmer an additional 10 minutes or up to 2 hours. Thin dal with additional water if needed. Garnish with cilantro leaves and jalapeno. Serve with spiced brown basmati rice.